File photo A dedication ceremony was held for the new veterans’ court in Greene County Common Pleas Court in November 2017. The specialized court, in action as of April 6, gives a hands-on approach to helping veterans through the criminal justice system. XENIA — Greene County Common Pleas’ veterans’ court held its inaugural session April 6, marking a historical first for the county. The specialty court assists veterans through the criminal justice system. When a veteran is arrested for a felony — depending on the type of crime — he or she can go through certain criteria to determine eligibility into the program. But first and foremost, the court is entirely voluntary. The judge said he plans to meet with defendants regularly, about every two weeks. Three men are currently in the court, and the judge said he suspects he won’t have more than 10 veterans in the court at a time. “[We’ll meet] just to review their cases to find out what they’re doing well, to find out what they’re not doing well. To find out what we can do to change that, to find out what their needs are — if we can assist them — that’s the concept,” he explained. Veterans’ courts differ from general division courts primarily because of this reason — the judge’s level of interaction — as well as the number of services that can be made available to participants. While the court is still a part of the criminal justice system, thus the dynamic of punishment is still present, treatment and communication — with a particularly positive angle — seem to be prioritized. “Our whole approach is we want to try to recognize their humanity and by virtue of our services that are available, try to fix them up with what is necessary to overcome that particular obstacle,” the judge said. Whether the veteran needs transportation, housing, clothing, food or employment, the court can help that individual fill that gap, he explained. In one significant way, Veterans Affairs provides treatment and counseling to help with substance abuse, PTSD or other mental health issues. Greene County Veterans’ Services Commission is also playing a big part, offering their own resources. Wolaver said those aren’t the only groups that want to see this court work. Community support, he said, began at the very inception of the idea for a Greene County veterans’ court. A particularly good example: each defendant is assigned a mentor. These mentors are veterans from the community. “Mentors are veterans themselves who obviously have a connection to our clients by virtue of the fact that they all served in various branches and so they speak to each other in ways that only people who have experienced what they’ve experienced can relate to,” Wolaver said. And statistically, specialized courts do work. As a general rule, participants in those courts have a higher rate of success than individuals who don’t have the same types of resources, Wolaver commented. During the first session, Wolaver told the three men in front of him that the effort must go both ways. “This is a partnership. We’re doing things for them, but I expect things from them, too. They have to follow our rules. They have to be working toward their rehabilitation,” he said. Wolaver said a veterans’ court in Greene County, an idea sparked by a brief conversation six years ago, is natural. Not only did he grow up in Fairborn, but his grandfather, father, brother and son are veterans. Wolaver said he was also in ROTC and his wife is a retired civil servant at Wright-Patterson Air Force Base. “The veterans have served us — they protected America — they’ve sacrificed — and sometimes these issues arise in their lives and sometimes they come into the criminal justice system so this is kind of our opportunity to pay it forward,” he said. Wolaver will continue leading the veterans’ court until the end of his term in 2020, when he hopes his successor will continue it. Now especially appropriate — in Courtroom One, behind his bench, every service flag hangs. 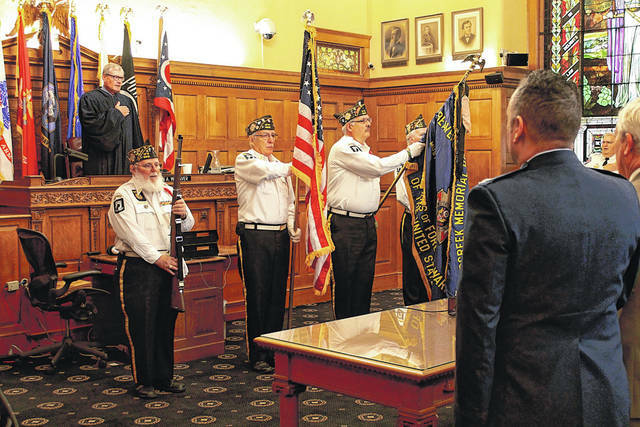 https://www.fairborndailyherald.com/wp-content/uploads/sites/50/2018/04/web1_Pledge.jpgFile photo A dedication ceremony was held for the new veterans’ court in Greene County Common Pleas Court in November 2017. The specialized court, in action as of April 6, gives a hands-on approach to helping veterans through the criminal justice system.